The people of Tulalip have a strong connection to their artwork. A walk through one of their many establishments, whether it be the Tulalip Resort Casino, the Hibulb Cultural Center or the Tulalip Administration building, you are sure to be blown away by the Coast Salish masterpieces that are proudly on display. Such art includes masks, story poles, drums, and art prints, all of which depict stories about the rich history and traditional lifeways of the Tulalip people. Recently, the Don Hatch Youth Center began incorporating more artwork throughout their hallways. Upon entry to the center, you are now greeted by a totem pole that stands at the center of the lobby, and if by chance you glance up, you will notice traditional paintings of a variety of animals lining the ceiling. 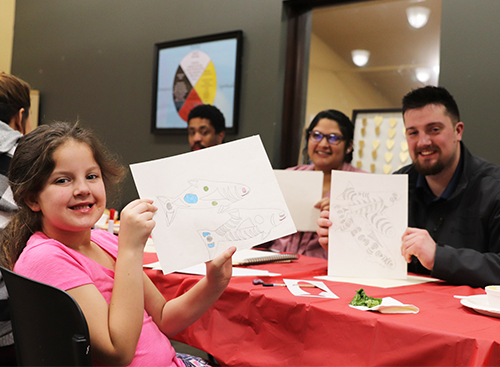 If you’re lucky enough to find some free time around 5:00 p.m. on a Tuesday, you can learn how to create traditional Salish art at the youth center by attending their weekly Honor Our Culture Night. 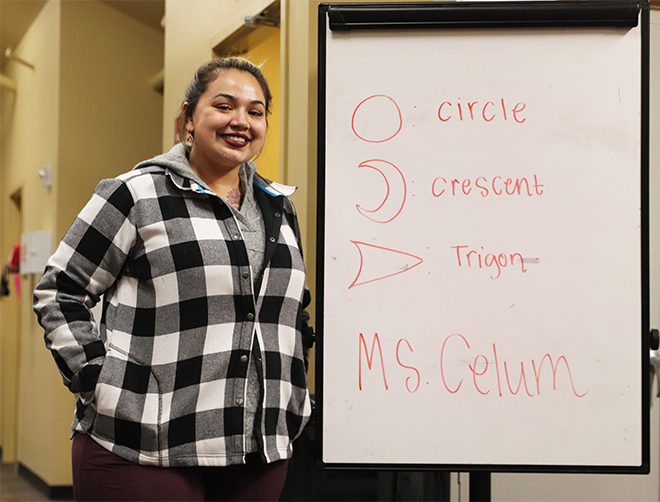 Lushootseed language instructor, Celum Hatch discusses the three shapes that comprise most of the art of the Pacific Northwest tribes; the circle, the crescent and the trigon. 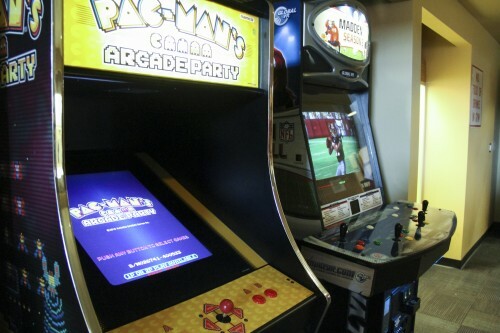 On the evening of February 26, a group of fifteen young adults rushed up to the second floor of the youth center. As the kids settled in and found their seats, they were given blank sheets of paper and pencils to practice three shapes that comprise most, if not all, art of the Pacific Northwest tribes; the circle, the crescent and the trigon. As the students worked on the shapes, Lushootseed Language Instructor Celum Hatch shared the Tulalip story, The Bear and the Ant, incorporating the traditional language into the lesson plan. 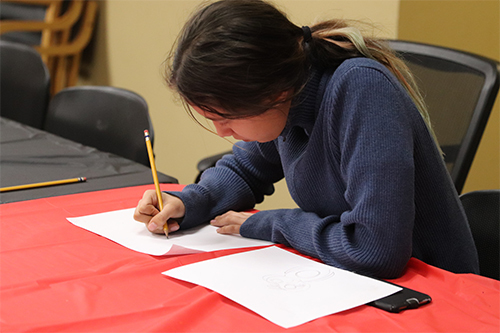 After drawing a few designs and listening Celum’s story, several kids left the room to participate in other activities at the center while a handful of students stayed behind to perfect their artwork. Honor Our Culture Night focuses on the vast elements of Coast Salish art while simultaneously explaining the history of each project. Currently, Culture Night is in the middle of a three-part drawing series that was actually inspired by the youth who requested the class in order to explore their heritage. Susan O’Day working on her design. 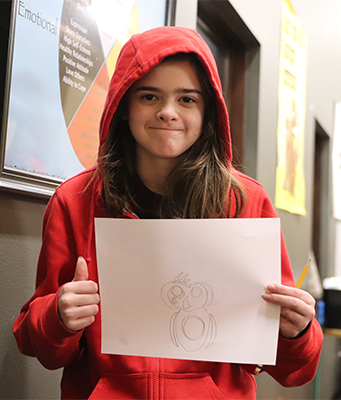 For the past three years, the night of traditional art has been organized by Rachel who watched the class evolve since it originally debuted in 2013. Not only has participation grown from the youth within the center, word has spread throughout the community and adults and elders now often frequent the upstairs classroom to learn more about the artwork. 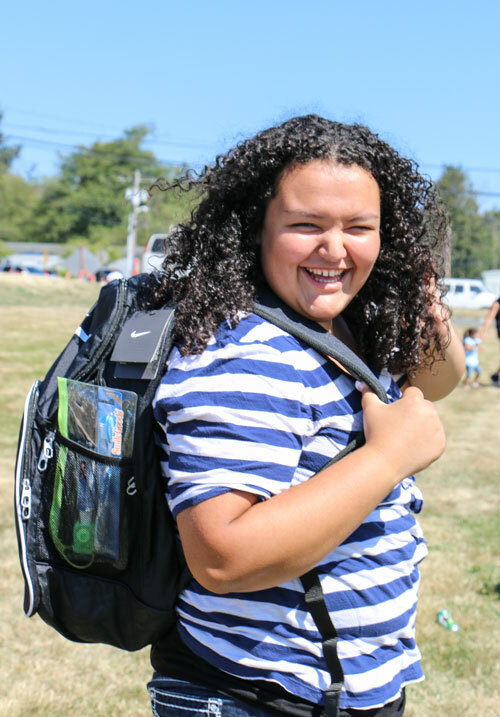 Many students are also young Tulalip tribal members who live off the reservation as well as Wellness Court participants who are fulfilling their cultural hours required by the court. Loretta Frye has fun learning about Pacific Northwest art styles. The students get to keep their finished projects which in turn can lead to further cultural enrichment, allowing the artists to use their work at traditional ceremonies. For instance, past Culture Night participants have used their handmade drums at local events including several coastal jams and drum circles. Rachel states that seeing the art being used in the community, as it was originally intended centuries ago, is a great way to connect the future generations with their ancestors. Ask any Coast Salish artist, carver or storyteller, there is a great deal of spiritual work that goes into constructing these projects. Youth Services wants to continue to produce items where the people can experience that medicine and continue to pass down that knowledge generation after generation. Honor Our Culture Night is held every Tuesday at the Don Hatch Youth Center from 5:00 p.m. to 7:30 p.m. For more information, please contact the Youth Center at (360) 716-4909. 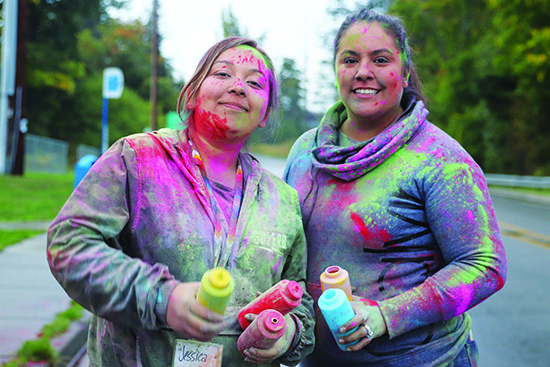 Three years ago, Tulalip Youth Services and the Marysville School District teamed up to bring Unity Month to the community during the month of October. 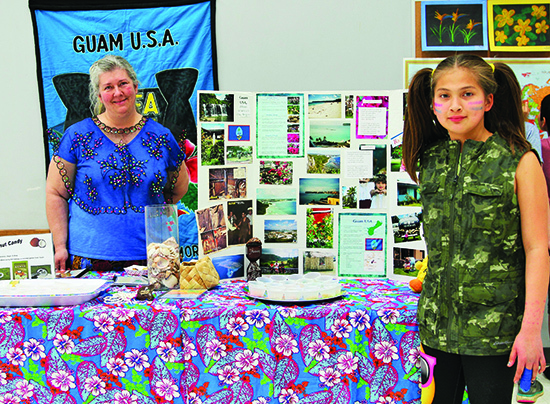 Jam-packed with exciting activities like movie nights, field trips to the corn maze and the pumpkin patch, school assemblies and pumpkin carving, Unity Month successfully sparked a lot of community involvement which afforded Youth Services the opportunity to talk about serious issues that are prevalent in many modern day Native communities. 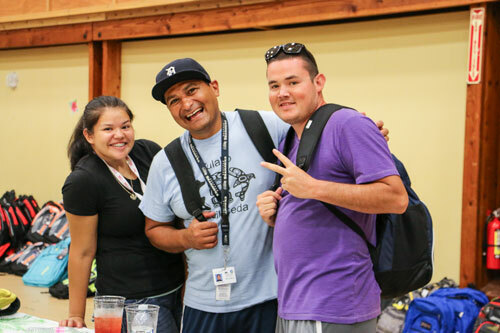 Youth Services and the school district decided to plan each week of the month with trainings and presentations focused on four issues that the youth of Native America are struggling with in today’s society; suicide, bullying domestic violence and substance abuse. 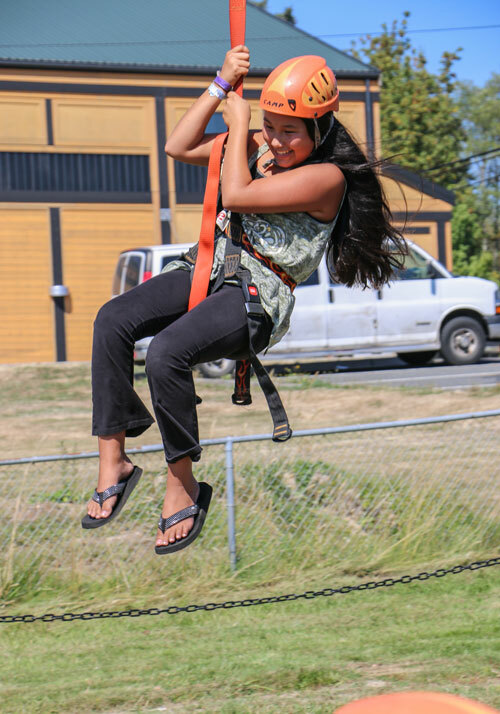 Due to tremendous success, Tulalip Youth Services continues to celebrate Unity Month annually, adding new improvements each year. While spreading awareness and providing prevention tools for serious topics, Youth Services also brings a positive outlook to each of these issues by celebrating life, promoting kindness and healthy relationships as well as participating in National Red Ribbon Week, an alcohol, drug and violence prevention campaign. With each week comes a new trendy hashtag for participants to use when posting photos and videos to social media while attending Unity Month events. This October began with #LifeisSacred week, kids learned that their lives matter and that they’re needed here by their families and friends. Youth Services partnered once again with the Community Health Department to bring QPR trainings to the community. QPR is an acronym for question, persuade and refer, the three actions you must take if someone is showing suicidal tendencies. Question if they are planning to harm themselves, persuade them to seek help and refer them to the appropriate resource. The class also teaches participants how to recognize the warning signs a person contemplating suicide may be exemplifying. Tulalip leader, Verna Hill, also spoke to the kids at Quil Ceda Tulalip Elementary about how sacred they are to the future of Tulalip. 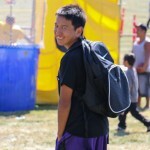 The suicide rate continues to escalate throughout Native communities every year. Eighteen states agreed to participate in a report conducted by the United States Centers of Disease Control and Prevention (CDC). That report showed that there are 21.5 suicides per every 1,000 Native Americans, over three and a half times higher than the national average. And according to the American Foundation for Suicide Prevention, suicide is the tenth leading cause of death in the US with 45,965 suicides each year. Suicide is also the eighth leading cause of death in the state of Washington where on average one person dies by suicie every eight hours. Native communities see significantly more lives taken by suicide than any other race in America which is why it’s important to openly discuss this issue, especially with the youth. 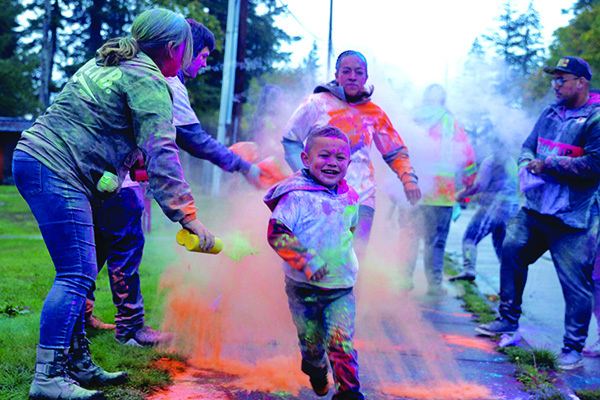 Tulalip Youth Services ended #LifeisSacred week in colorful fashion with the extremely popular annual Say Something Color Run. 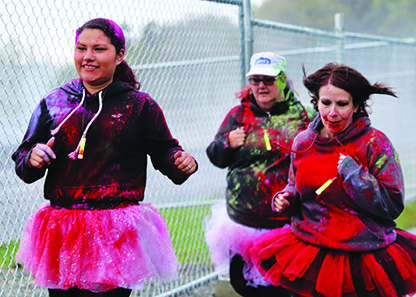 A little rain didn’t stop the community from showing out and ending their Friday with a mile run from the Tulalip Community Health Department to the Kenny Moses Building on the afternoon of October 5. 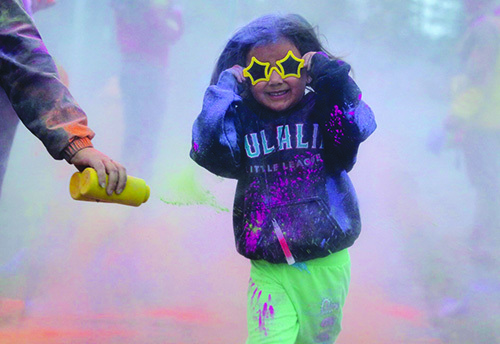 With stylish, protective eyewear and clothes they didn’t mind getting dirty, the community ran through multiple checkpoints along Marine Drive where they were blasted with colorful chalk, resulting in tie-dyed runners reaching the finish line. 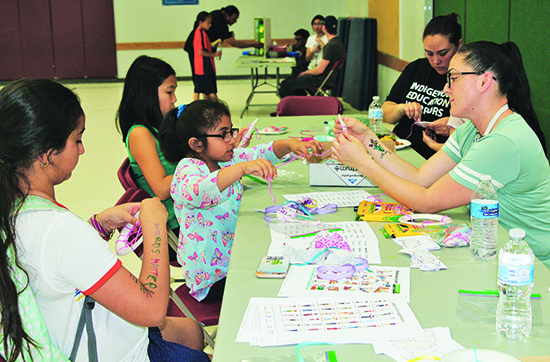 Youth Services has more fun, educational events planned for the Tulalip community for the remainder of Unity Month, including cultural events each week and Halloween-inspired activities. To view the entire Unity Month events and activities schedule, be sure to check out the Tulalip Youth Services Facebook page. 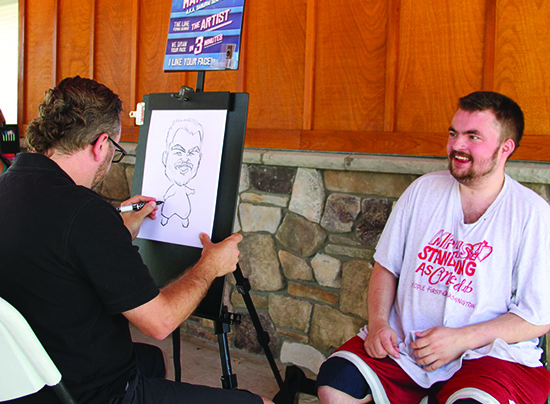 There was no shortage of laughter and joy on the sunny afternoon of July 29, as the Tulalip community gathered for the second annual Special Needs Field Day held at the Kenny Moses Building. 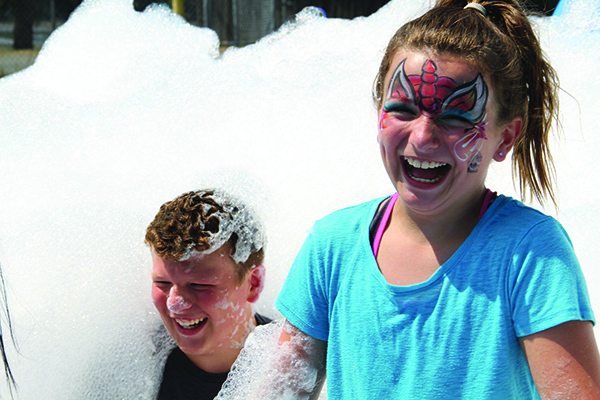 The summertime event, hosted by Tulalip Youth Services, caters to the local children of Tulalip who are living with learning or physical disabilities, providing a fun-filled day for the kids and their families. 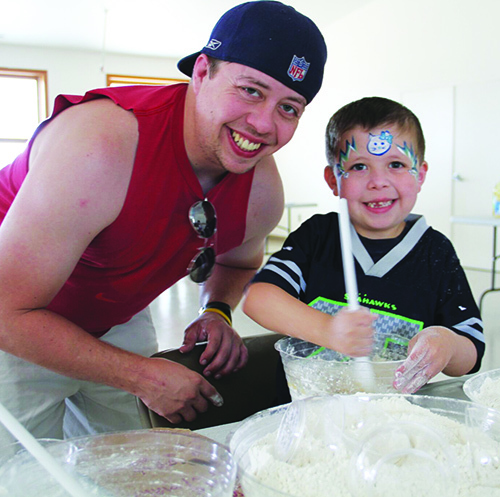 The community turned out in large numbers as around seventy people showed up for the field day event to create everlasting memories as well as an assortment of crafts such as slime and glitter bottles. Two big bouncy houses were setup next to the longhouse overlooking Tulalip Bay. 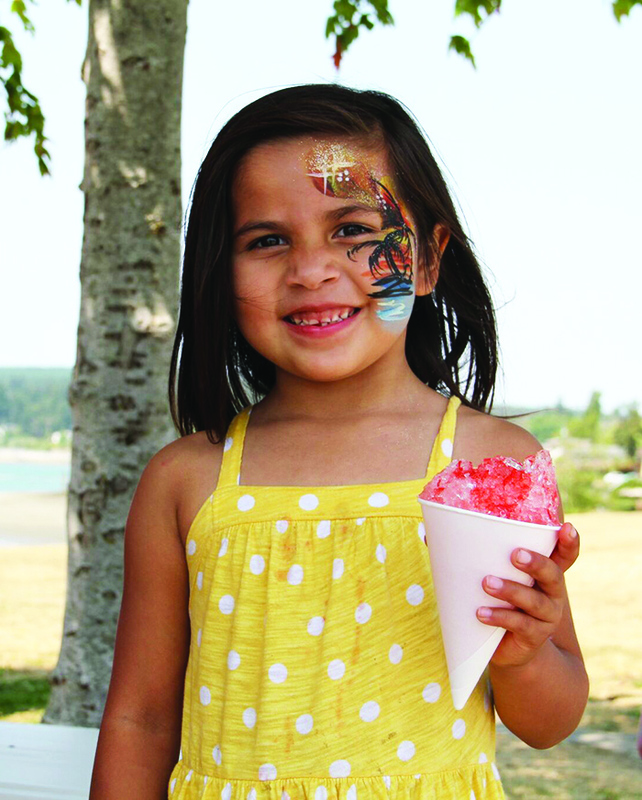 The kids enjoyed snow cones as they posed for caricature portraits and received henna tattoos and face paintings. 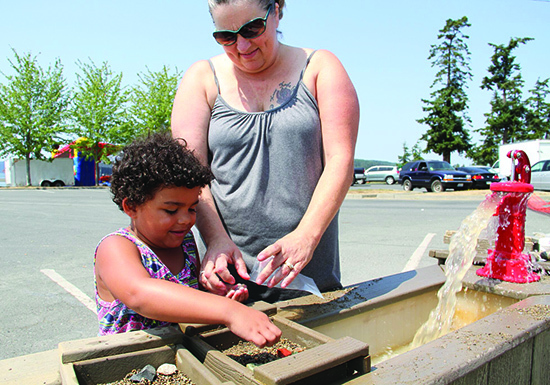 The fan favorite gold-panning station returned, which is a hands-on experience that allows the special needs children to explore and engage in sensory play that is both fun and not too overstimulating for them. 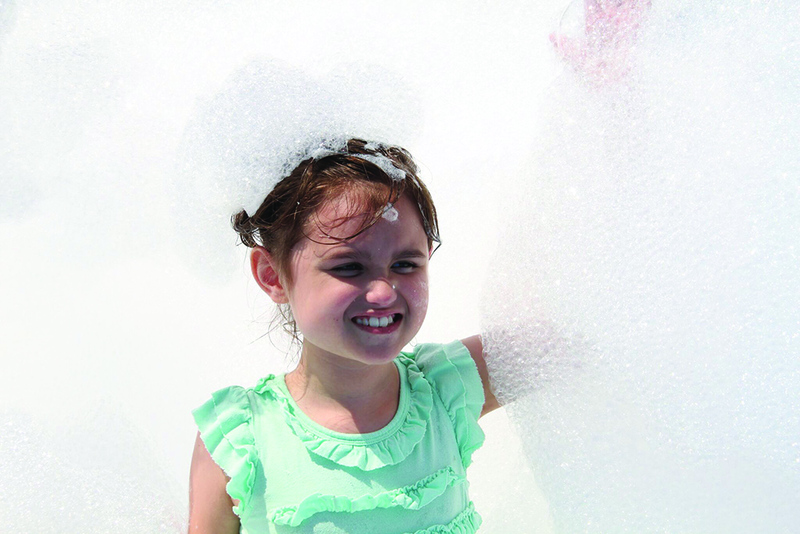 This year, Youth Services added a new activity, a foam pit, which easily became the new favorite amongst the kids as they enjoyed escaping from view of their peers, popping in and out of the bubbles during hide-and-seek. Upon arriving to Special Needs Field Day, young Chris Ring was ecstatic to see some of his friends and counselors at the event. Fresh off an undefeated season with the Battle Creek PGA Jr. League, young tribal members and brothers Braiden and Brodie Kane were in attendance. Decked out in face paintings and tattoos, the brothers visited every station throughout the day. 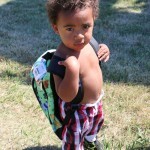 “My favorite part was everything!” exclaimed Braiden. After an exciting day, the kids were tired out as they said goodbye to their pals and began to journey home. 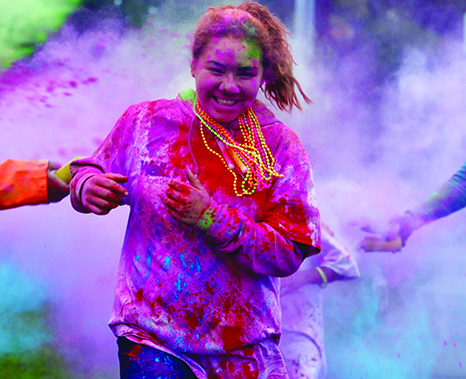 For additional information, including upcoming special needs youth events, please contact Joe Boon at (360) 716-4912. 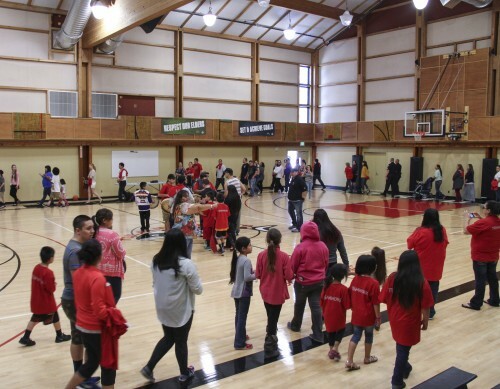 Students of Quil Ceda Tulalip Elementary, along with their families, were captivated by the richness of Native American song and dance during the Cultural Fair held on the evening of April 24th. 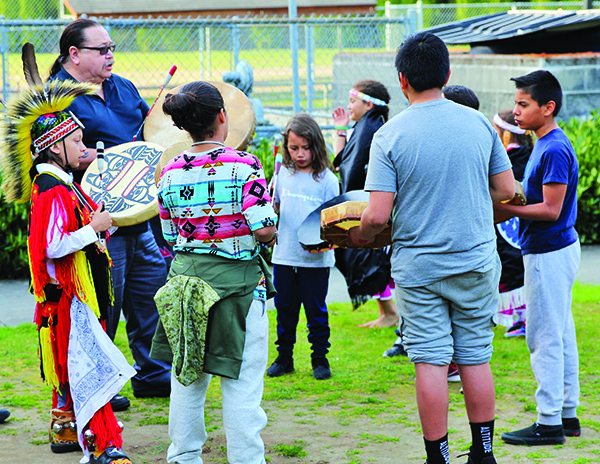 In collaboration with Marysville School District (MSD) Indian Education, Tulalip Youth Services and school staff, the Cultural Fair celebrated the wonderfully diverse community that is the Tulalip/Marysville area. Over a hundred participants filled the elementary multi-purpose room where a hearty dinner was enjoyed by all. 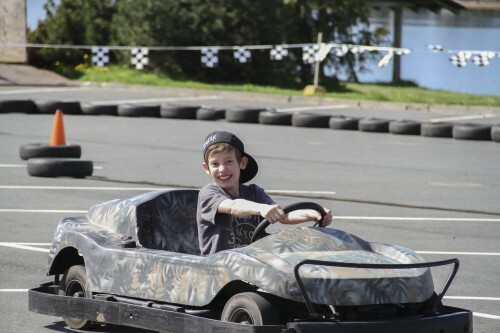 Following the meal, there was a variety of family-friendly activities to engage in. 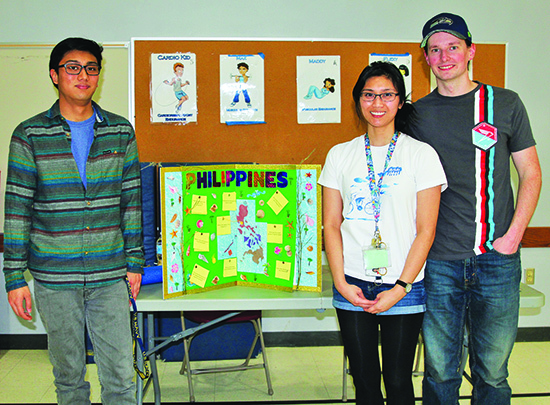 Interactive booths and presentations represented several cultures from around the world, including Tulalip, Guam, the Philippines and the United Kingdom. As fair goers made their way around the room they gained insights into other cultures and traditions. Of course, the variety of Native cultural stations was the most popular. 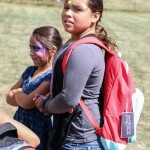 There was dreamcatcher making under the guidance of experienced staff members and even a fry bread station manned by Chelsea Craig and her daughter Kamaya. 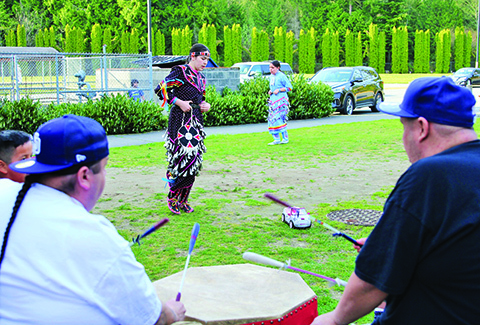 With the weather cooperating, many people wound up outside after hearing the call of the Native round-drum. 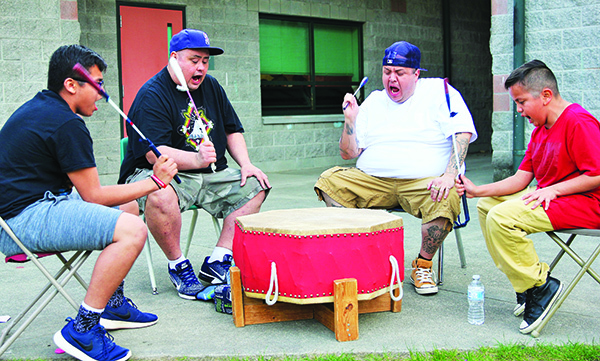 Terrance Sabbas, Native Liaison for MSD, led a series of round-drum songs that held the attention of everyone young and old. Several young girls, dressed in their powwow regalia, shared their dance skills to the rhythmic beats of the drum. The musical jam session continued with a variety of hand-drum songs led by Ray Fryberg. The Cultural Fair was a success in putting a spotlight on the richness of a diverse community; knowledge was gained and shared. For those with a strong understanding of historical context, the fact that so many were able to participate in traditional song and dance is a testament to the strong Native spirit. “When the boarding school was here, our songs, our dances and all our ceremonies were prohibited by law. It was the aim of the government to assimilate the Indians into American society. For many years our people couldn’t speak their language or sing their songs for fear of punishment,” explained Ray Fryberg, Executive Director of Natural Resources. “It’s important for us to know who we are and where we come from, to retain the parts of our culture that make us unique. The boarding school era sought to take all that away from us, but we endured. 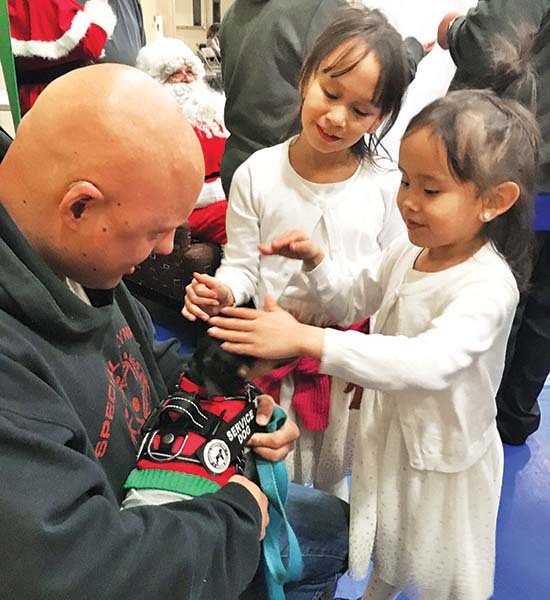 During the evening of Tuesday, December 12, the Tulalip Youth Center came alive with the sounds of holiday music and children’s laughter. 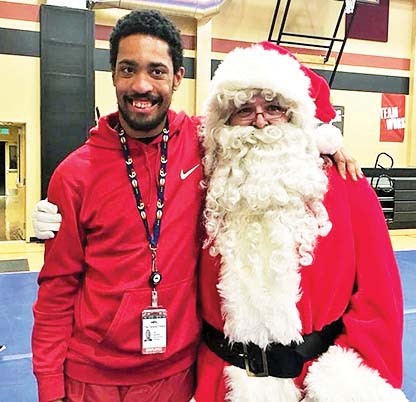 The festive atmosphere was the result of a joint effort by Youth Services and Leah’s Dream Foundation to host an early Christmas party for Native students with specials needs and their families. 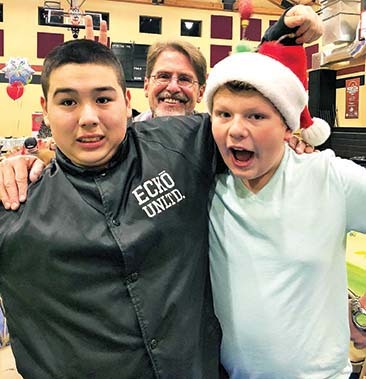 “So thankful for the many people who worked hard to put this event on for our Native youth with disabilities,” said Amy Sheldon, a longtime officer of the Special Education Parent Advisory Council. “It’s these amazing people who support our kids [and have a] passion for change. As we continue to work hard we can make a difference. The evening’s holiday cheer included many fun activities and craft making, like creating hand-made ornaments for Christmas trees and making ginger bread houses. Even Mr. and Mrs. Clause made a surprise appearance to take photos with their spirited guests. “I say a prayer of inclusion. I pray not to be isolated during this holiday season. I pray for the resources that I need to be included in family and community activities. I may need some help when I wake up in the morning. I may need some help getting bathed and dressed and fed. I may need a little extra time. “Be patient with me if I seem anxious, depressed, or distracted. Living with disability is not easy. I still want to be included. I want to show you what I can do. I want to help. Let me show you how capable I am. I’m an asset to my community. 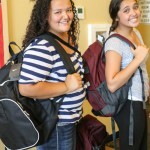 BackpackDist2014 from Tulalip News on Vimeo. 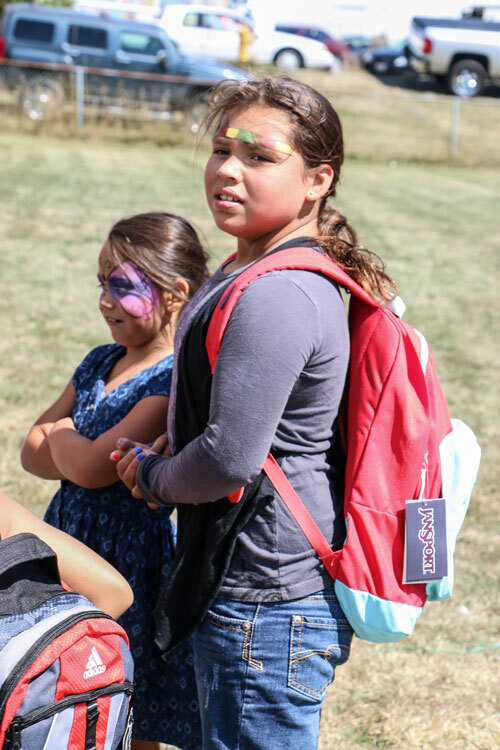 TULALIP – The annual Tulalip Tribes Youth Services backpack distribution kicked off the farewell to summer as hundreds of Tulalip youth attended a block party held on Tuesday, August 26, at the Don Hatch Jr. 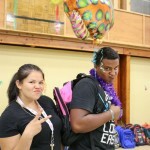 Youth Center. 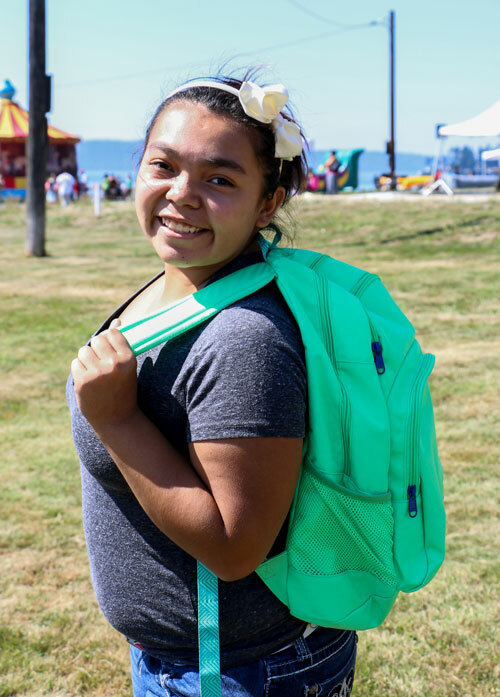 The annual event, held at the Quil Ceda & Tulalip Elementary School in the past, was held for the first time at the youth center, which accommodated space for a large lunch, education booths, backpack distribution, and the highlight of the event: games and carnival-like activities. 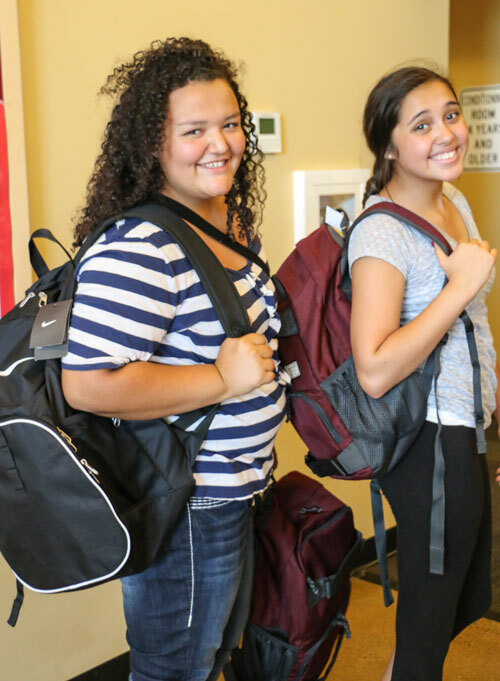 Tulalip tribal youth and other Native youth, Pre-K through 12th grade enrolled in the Marysville School District, were provided a backpack filled with basic school supplies required by grade, which helps to lessen the back-to-school cost experienced by parents. 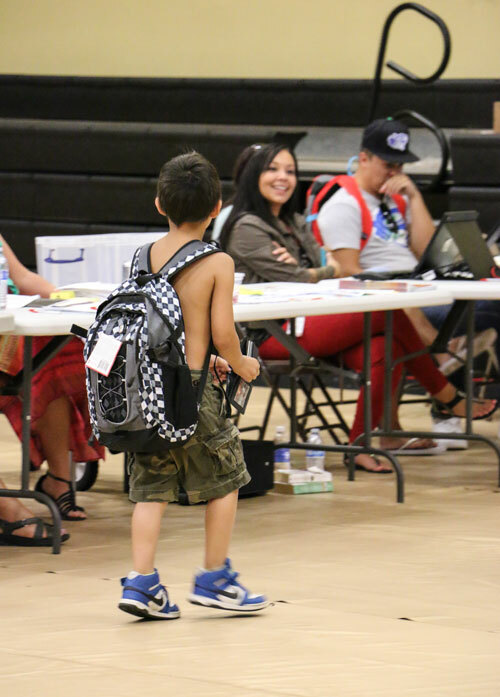 Tulalip Tribes Youth Services distributed over 1,400 backpacks during the event. 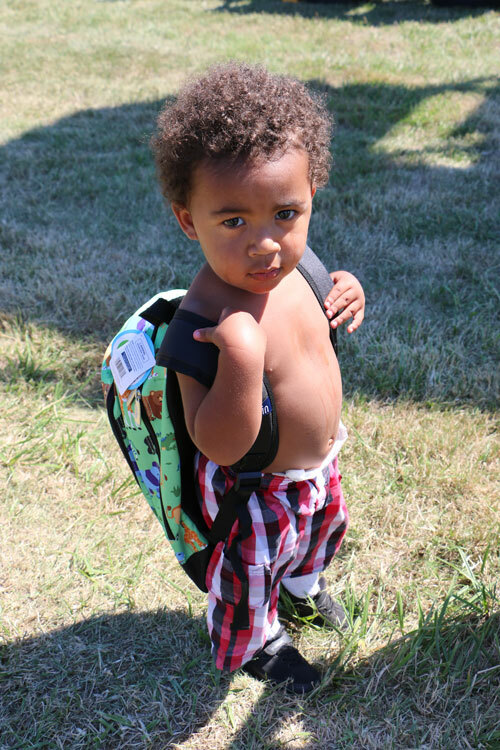 Youth not present at the block party to receive a backpack may contact the Youth Services Department at 360-716-4902 to collect their backpack. Fifteen-year-old Tulalip tribal member Demery Johnson, in her second year participating in the Tulalip Tribes Youth Employment Program, says her position in Tulalip Probation is helping her gain work skills she hopes to use in business administration one day. TULALIP – Each year Tulalip youth, 14 -18 years old, have a chance to gain work experience before graduation through the Tulalip Tribes Youth Employment Program. 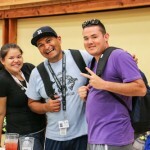 The program, funded by the Tulalip Tribes Youth Services Department, is designed to provide Native youth with a positive work experience to foster future growth. This year funding was available originally for 70 positions with a stipulation that youth applying attend a three-day orientation and meet a 2.0 GPA standard. After receiving additional funding allocated by the Tulalip Board of Directors, the GPA restriction was removed and 30 additional positions added. 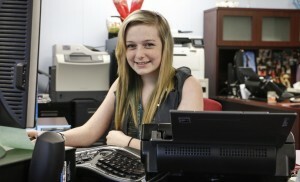 The program, at the time of this article, had 75 youth employed. “The most important role of this program in the community is that we are showing our youth that work and dedication is important. 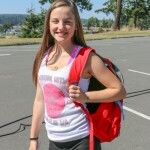 Starting work at a young age is a good thing, then they they turn 18, they are more prepared to get a job and be successful employees,” said Jessica Bustad, Tulalip Youth Services Education Coordinator. 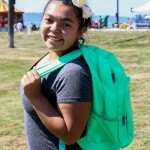 The goal of the program she says “is to have youth gain skills, confidence and knowledge that they can use to obtain a full time job in the future.” This essentially puts youth who participate in the program ahead of their peers when applying for future jobs. These youth will have already established critical job skills that ensure success, such as abiding by professional standards, keeping confidentiality, and time management. 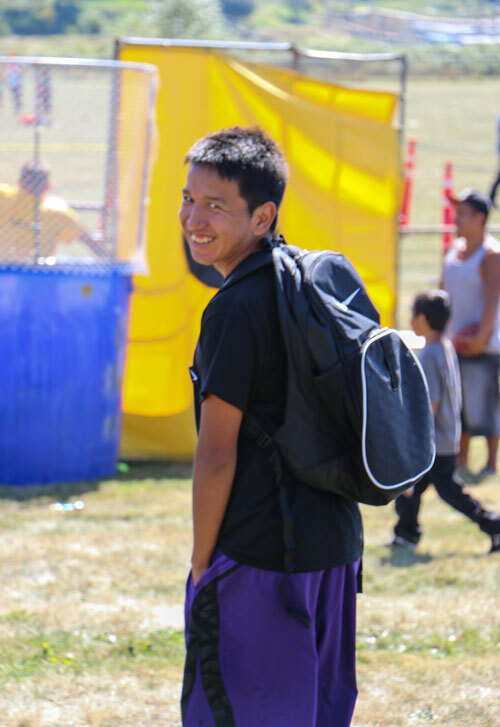 Youth are treated like regular employees, which means they are required to work a typical 40-hour workweek, a task that may seem daunting for those who are suddenly required to conduct themselves in a professional manner in a government setting, such as the Tulalip Tribes. However, many youth relish in the opportunity to be responsible. Demery Johnson is one of them. 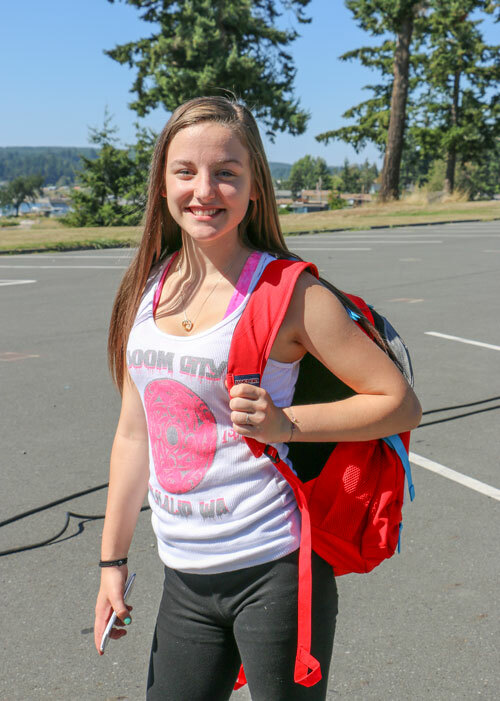 Despite being only 15, and in her second year working in the program, she chose to work in the Tulalip Tribes Probation Department at the Tulalip Tribal Court, a position that requires strict confidentiality and professionalism. Although a court house and a probation department may seem like high-risk positions to have youth work, Bustad explains the Tribe’s youth services education staff decide job placements based on surveys youth fill out that ask questions such as what their interests are. “We provide the youth with a survey and look at what requests we have for youth. We try to place youth where they will be successful and interested. This can also be a challenge if we do not receive youth worker requests from departments that youth wish to work at,” said Bustad. Tulalip skateboarders gather after a meeting held on May 15, with Seattle’s Grindline lead designer Micah Shapiro, on design ideas for new Tulalip skatepark. 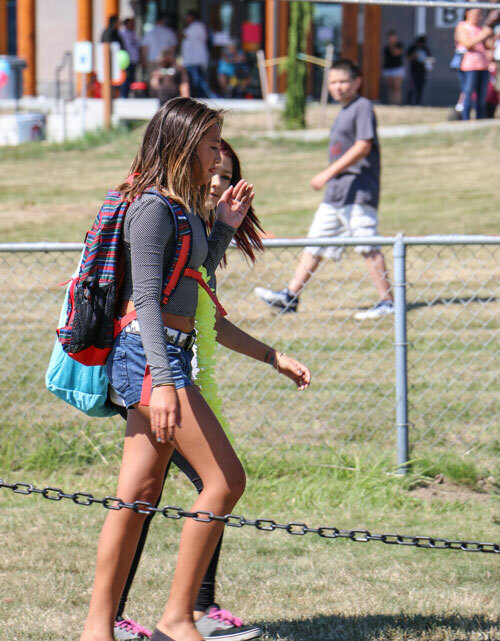 TULALIP – Skaters and longboarders had reason to celebrate on May 3, when the Tulalip Board of Directors made a motion to approve funding to build a skate park in Tulalip during a regular board meeting. Tulalip Skate Park, the unofficial name the park is being called currently, will join a number of skateparks being built on reservations across Indian country, such as recently opened Port Gamble S’Klallam and Lummi Skatepark, opened in April. A community meeting was held on May 15, at the Tulalip Don Hatch Youth Center, to discuss design ideas, site location, and park size. 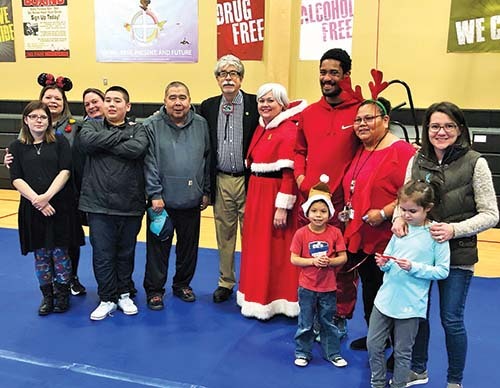 In attendance were nearly 20 Tulalip youth, including Tulalip Board of Directors, Marlin Fryberg Jr., Deborah Parker, Les Parks, Theresa Sheldon, Marie Zackuse and Tulalip Interim General Manager Misty Napeahi. Micah Shapiro, lead designer for Seattle concrete skatepark design and construction company, Grindline, was also in attendance. 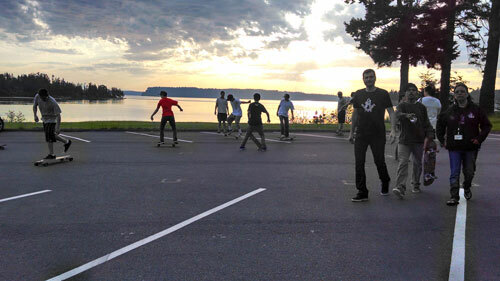 Tulalip skateboarders show off their skills in possibly location for new Tulalip Skatepark during meeting held on May 15, with Seattle’s Grindline. Grindline, who built the Port Gamble S’Klallam Skatepark, creates progressive and engaging skateparks with a design philosophy that each skatepark be tailored to its users and existing surroundings, and welcomes community engagement during the design process. Two sites are being considered for the park’s location, the grassy area in front of the youth center’s council room parking area and across the street from the Greg Williams Court, by the Tribe’s old finance building area. Youth favored the site across the street from the Greg Williams Court due to parking, length of skatepark use, elimination of possible beach erosion, and the incorporation of natural elements into final design ideas. 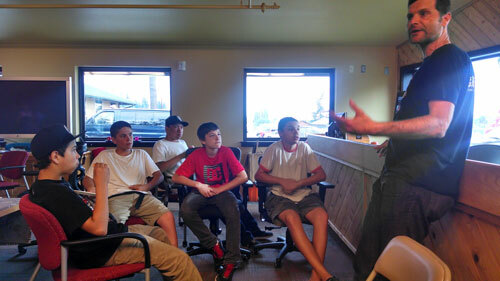 Seattle’s Grindline lead designer Micah Shapiro talks with Tulalip skateboarders on May 15 about conceptual design ideas for new Tulalip Skatepark. Youth presented conceptual ideas along with concerns about park use, amenities, size and safety. Youth advocated for onsite security to eliminate potential drug use or selling in the area by visitors. Size of the park was another concern for youth, who toured local parks for ideas. The requested 10,000 to 12,000 square feet would allow for a variety of skating elements in one structure, and cost up to $400,000. Tulalip skateboarders listen to budget concerns in a meeting held on May 15, about the newly approved Tulalip Skatepark. 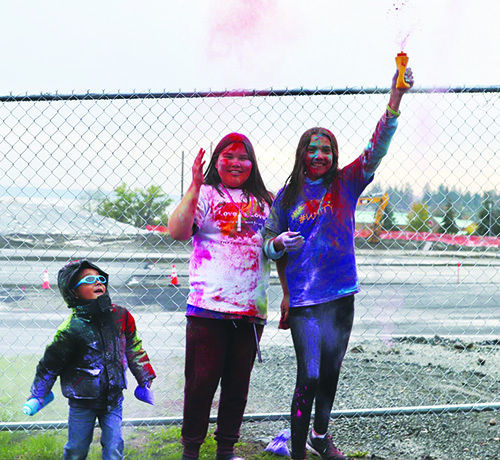 “It will come down to budget,” said Tulalip Board Member Marlin Fryberg Jr., about park amenities, such as a request for a roof over the skatepark. “We will have to come up with different options and designs and then go from there. We are not ruling out roof, but that may have to be in phase two of the project. A final design plan is still being drafted and will include size, location, budget, and skatepark amenities. A budget will be presented once the final design is complete. For more information on the next community skatepark meeting please contact, Tulalip Youth Services at 360-716-4909. 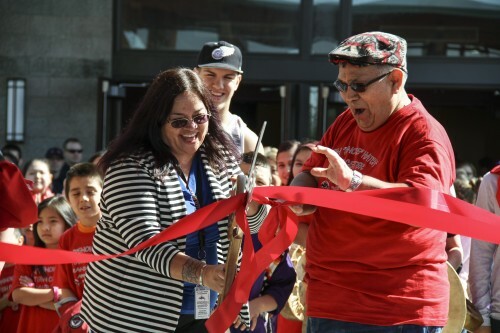 The ribbon was cut on April 7, 2014, by Tulalip Tribes General Manager Sheryl Fryberg and former Tulalip Board member Don Hatch Jr., which the center is named after, to mark the official opening of the new center that will provide youth, 13-17 years old, a positive environment to hang out in. TULALIP, WA. 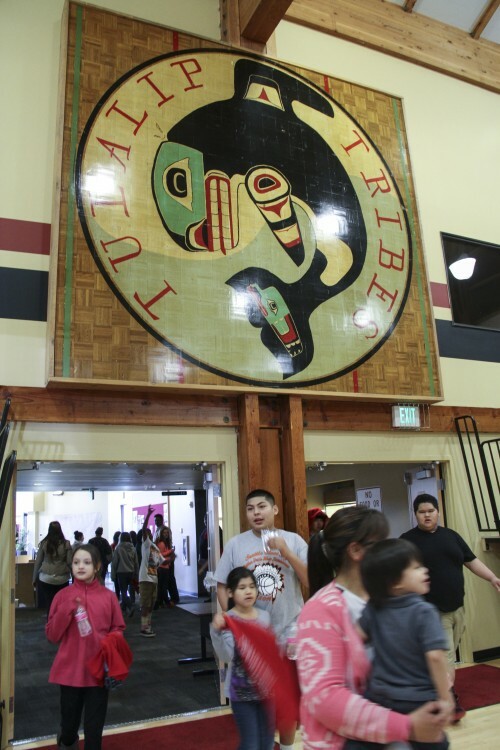 – Tulalip youth, 13 to 17 years old, now have a building to call their own with the opening of the Tulalip Don Hatch Youth Center. 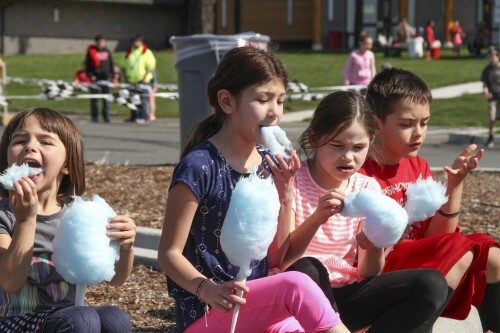 A ribbon cutting ceremony held on Monday, April 7, coincided with the first day of spring break for Tulalip youth, and marks the official opening of the center that was designed with this age group in mind. 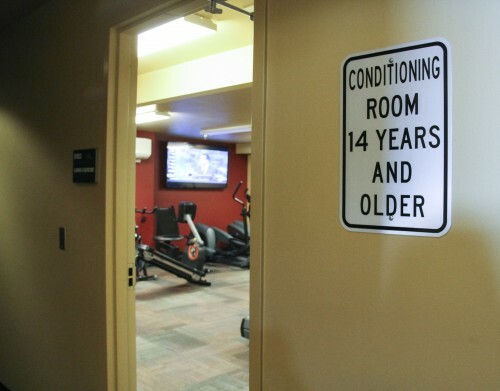 Amenities in the center include a new basketball court, game room, work out room, and large commons area for studying or visiting. 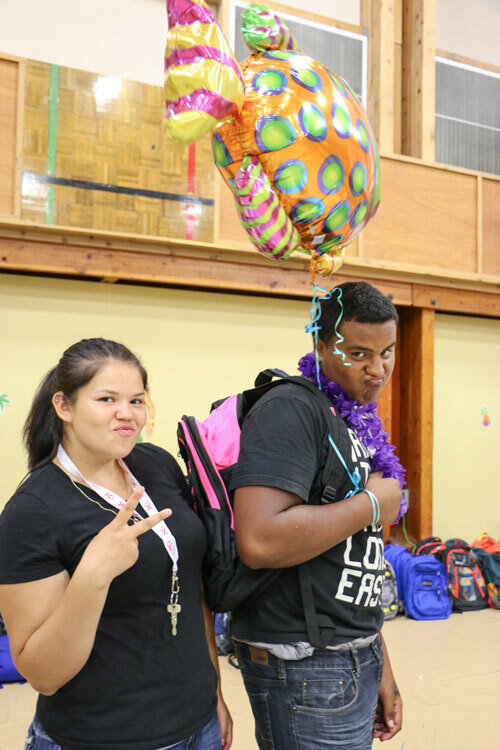 For questions about the Don Hatch Youth Center, please contact Tulalip Youth Services at 360-716-4909. 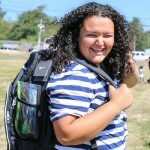 Tulalip Don Hatch Youth Center opening ceremony from Brandi Montreuil on Vimeo. Above the new basketball court in the Don Hatch Youth Center gym hangs the former basketball middle court emblem which previously used to be where the new youth center sits. The new Don Hatch Youth Center’s gym still displays on the walls cutouts of the former basketball court flooring that new center’s basketball court replaced. 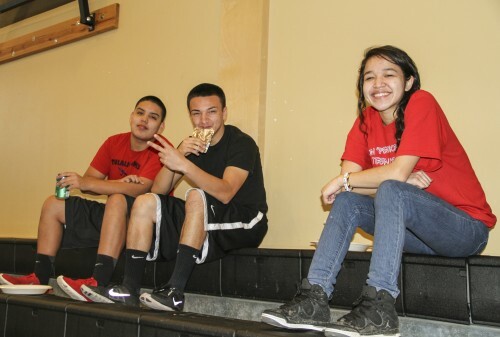 The Don Hatch Youth Center will be available to Tulalip youth, 13-17 years old. 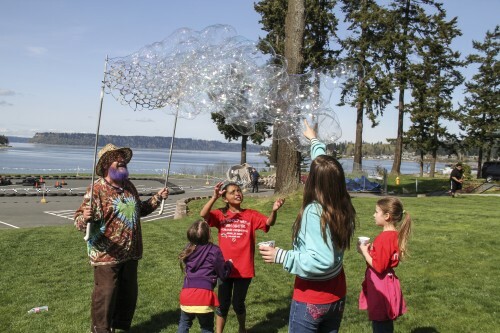 The Don Hatch Youth Center ribbon cutting ceremony, held on April 7, 2014, included a packed day of fun activities for Tulalip youth, including a visit from the Bubble Man, Garry Golightly.